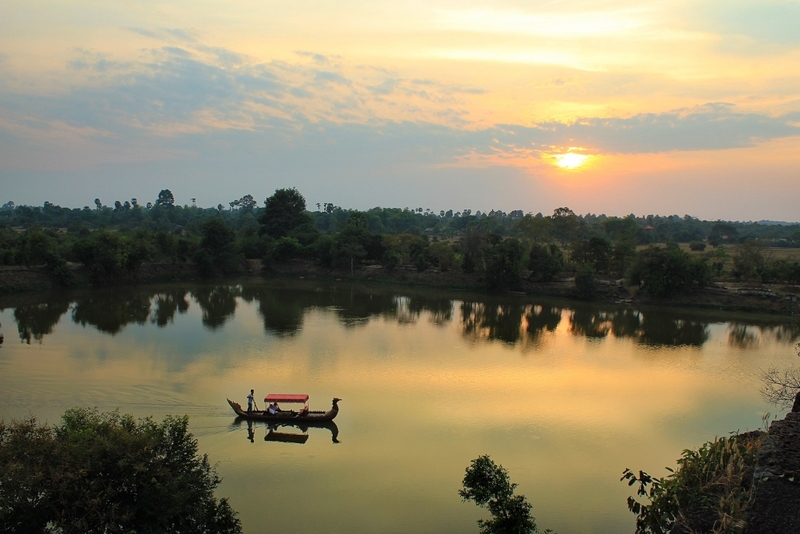 Known as the ‘Kingdom of Wonder’, Cambodia is a country full of surprises. 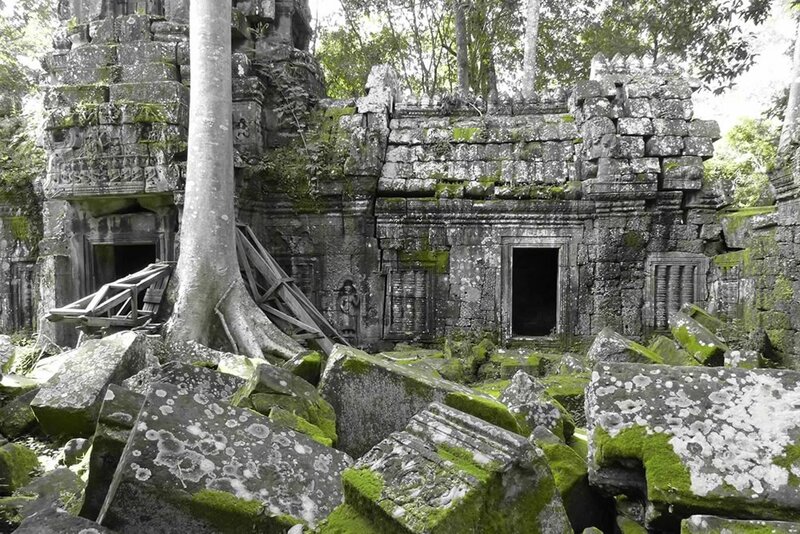 We can help to understand this magical country by arranging for you to hear a survivor’s harrowing stories of the Khmer Rouge at one extreme and by guiding you through the incredible ancient temples of Angkor at the other, whilst avoiding the crowds in each destination. Say ‘Cambodia’ and the immediate reaction is ‘Angkor Wat’ – the world’s largest religious monument. The ancient UNESCO temples of Angkor are mind-blowing and should be incorporated into any Cambodian experience. However to understand the sombre past of Cambodia, visit Phnom Penh’s genocide museum and the killing fields where the Khmer Rouge inflicted so much turmoil on the population, 60% of which are under the age of 30. Venture off the tourist trail to Battambang for its French Colonial elegance and bamboo railway. Travel further afield into the Cardamom Hills, to explore the mangroves, forested mountains and Tatai waterfall. We can also arrange trips in the east to understand Ratanakiriand’s hill tribes and trek with Mondulkiri’s wild elephants. Alternatively soak up some rays on the southern pristine coast with fresh seafood and uninterrupted horizons. From £2,500 per person, for 10 days including accommodation, private guiding, entrance fees and private transfers (not including flights). The current reigning King Norodom Sihamoi is a former ballet dancer and is the only monarch in Asia who is partly of French descent. Khmer New Year (13th-17th April). When the harvest has finished, the nation enjoy celebrating the start of the monsoon by soaking each other in water. Fish Amok is the catch of the day served in a creamy coconut and lemongrass curry. For the more adventurous, cricket and tarantula are on the menu. ‘First They Killed My Father’ by Loung Ung. A firsthand account of a Cambodian child’s experience during the Khmer Rouge regime. Green, black, red and white Kampot pepper corns all produced from the same plant in southern Cambodia. Within Siem Reap you will be spoilt for choice with the luxurious Amansara, the traditional La Résidence D’Angkor, the colonial Raffles, the rustic Phum Baiting, the art deco Park Hyatt and low-key Sala Lodges amongst many other boutique and interesting hotels. 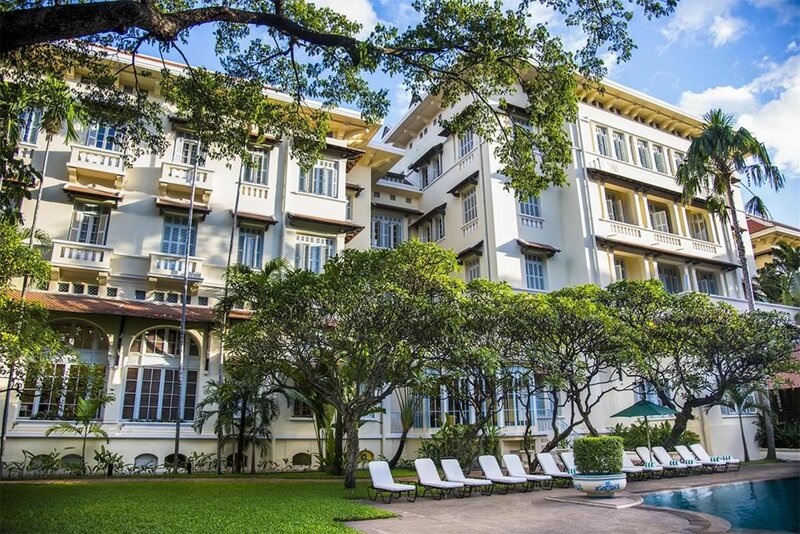 The Raffles Le Royal, oozes colonial charm and history, whilst the Rosewood takes a more modern approach with incredible views from the Vattanac Capital Tower. Then there are a number of boutique hotels scattered around the city and some of our favourites include Villa Langka, The Pavilion and Arunreas. Stay well clear of the built up area in and around Sihanoukville and either relax in Kep at the boutique art-deco style Knai Bang Chatt or Villa Romonea. 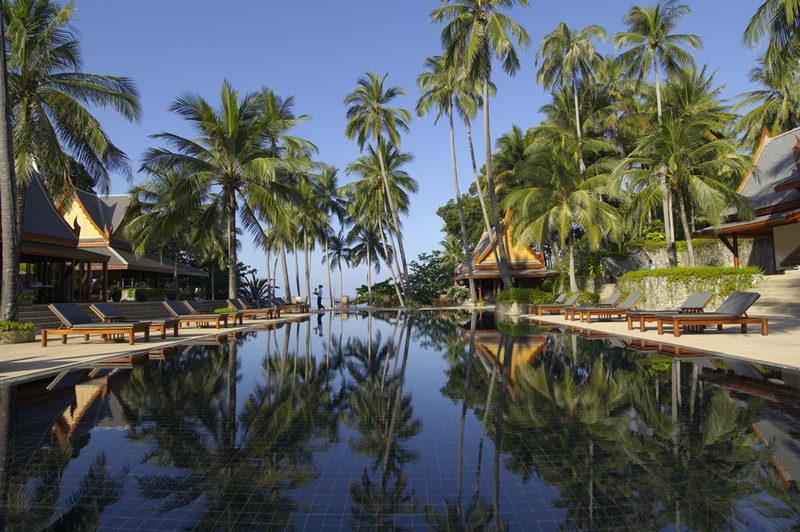 Alternatively splash out and take a speedboat to the private island of Song Saa for the ultimate romantic get-away, enjoy the incredible beach at Alila Villas on Koh Russey or indulge in a wellness experience at Six Senses Krabey Island. You don’t have to travel far from Siem Reap or Phnom Penh to reach more remote lands where you can stay in a floating eco-tent in the Cardamom mountains, a traditional Khmer village house or the incredible Shinta Mani Wild for the ultimate glamping experience. 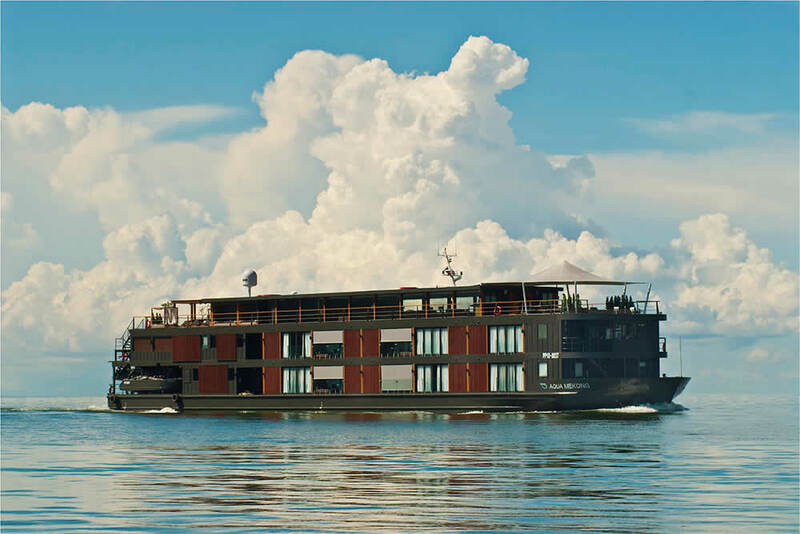 You may also wish to consider hopping aboard the Aqua Mekong boat, linking Vietnam and Cambodia for anything from 3-7 nights. The country is made up of a number of sprawling waterways and we have some unusual ways of exploring them. Travel the Mekong by private sampan or luxury vessel, kayak or take a private boat through the stilted villages of Kompong Khleang and the floating villages of Kompong Phluk on the edge of Tonle Sap. We can also arrange a private dragon boat at sunset on the moat of Angkor Thom, with that all important sundowner in hand. Siem Reap is the gateway to the majestic Angkor ruins, discovered over a century ago by explorers on elephant back. Today, our skill is to avoid the crowds at Bayon, Ta Prohm, Angkor Thom and Angkor Wat. Then discover the more remote, quieter ruins to appreciate this incredible architecture in peace, surrounded by dense jungle and bamboo forests. We can organise various modes of getting around by bicycle, tuk tuk, helicopter, on foot or a judicious combination. We can also arrange private temple dinners by candle light with Apsara dance entertainment. 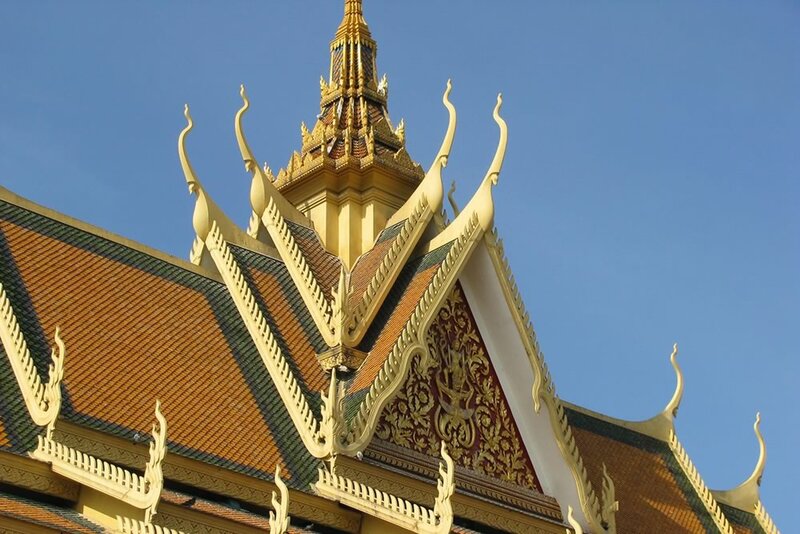 Known as the ‘Pearl of Asia’, Cambodia’s capital is home to the killing fields and the Tuol Sleng Museum of genocide. These harrowing reminders of Pol Pot’s regime are best discovered with a survivor of the prison. It is always the guides that bring places to life so we also suggest spending an afternoon with an architectural student to learn about the history of the buildings in Phnom Penh by cyclo, allowing you to be open to the elements, weaving in and out of the local markets and through scooters whizzing through the streets. Rather than flying to the more crowded but picture perfect beaches of Thailand or Vietnam, stay in Cambodia to soak up the rugged coastline around Kep. This former French colonial destination enjoys mouth-watering freshly caught fish and crab accompanied by Kampot pepper which you can handpick in the surrounding area. 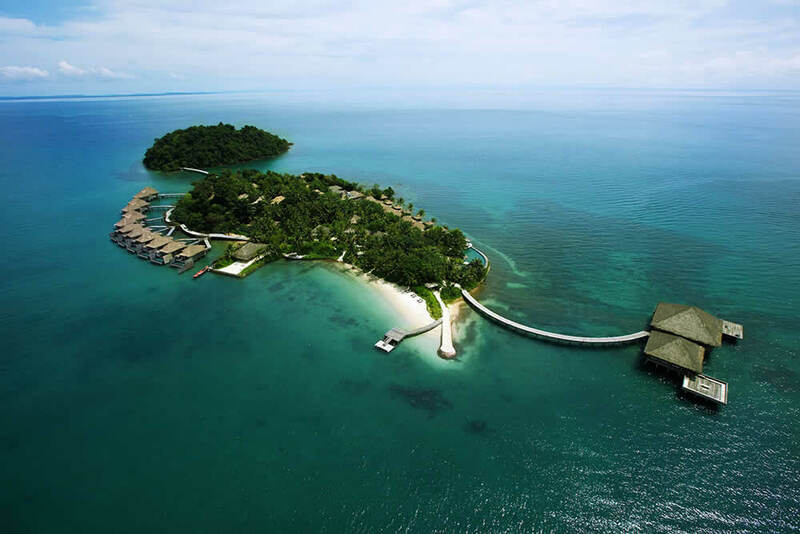 We can arrange excursions to ‘Rabbit Island’, private beach barbeques and water sports for all the family. ‘Templed out’ in Siem Reap? Get under the skin of the ‘real’ Cambodia with a trusty guide and cycle the backroads, explore Tonle Sap, venture into the back of beyond by quad bike, horseback or ox cart and enjoy a special 5 course Khmer dinner in the middle of nowhere by candle light when all that can be heard is the high pitched song of the cicada and children playing in the fields nearby. Cambodia’s main religion is Theravedic Buddhism which puts an importance on family, so the locals happily embrace children. We have plenty of tricks up our sleeve to keep both kids and parents entertained. Zip-wiring through the jungle, quad biking through the countryside, kayaking on Tonle Sap and access to front row seats at the Cambodian circus where the comical acrobatics give the Circ du Soleil a run for its money. 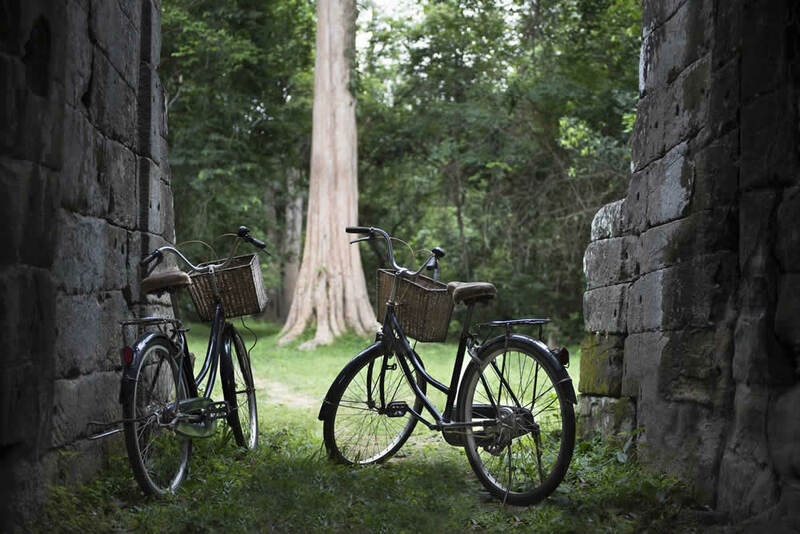 Whilst exploring the Angkor temples we can challenge your youngsters to a scavenger hunt with clues to follow on tuk tuk or by bicycle. 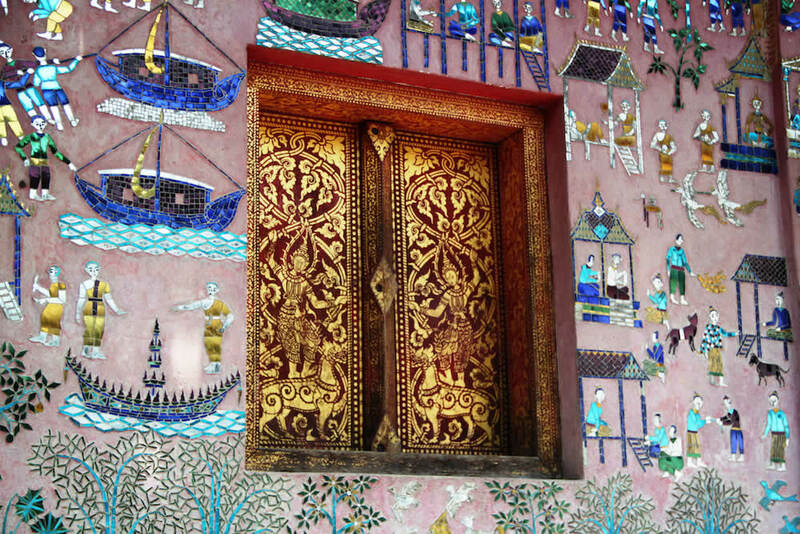 Bangkok is the main gateway to south east Asia, so spend a couple of nights exploring this fun capital with one of our expert guides and recover from your jet lag, before delving into the rich culture of Cambodia. There is a direct flight from Siem Reap to Luang Prabang or from Phnom Penh to Vientiane making it easy to soak up this laid-back, relaxed country with the Mekong flowing through it. Combining Vietnam and Cambodia has never been easier, either by boat along the Mekong or with a short flight into Hanoi, Da Nang or Saigon, where we can arrange numerous special experiences. We can arrange access to the temples of Angkor after all the visitors have left, and light up the ruins by candles, so that you can enjoy the spectacular sight to yourselves over a gourmet dinner or perhaps share it with some APSARA dancers, musicians and Cambodian Phare circus performers to celebrate in true style. We have a number of other secret venues up our sleeve, perfect for a celebration, be it in a private tented camp, chartering a boat on Tonle Sap, a Khmer house in middle of the Cambodian countryside or a stylish colonial building in central Siem Reap. 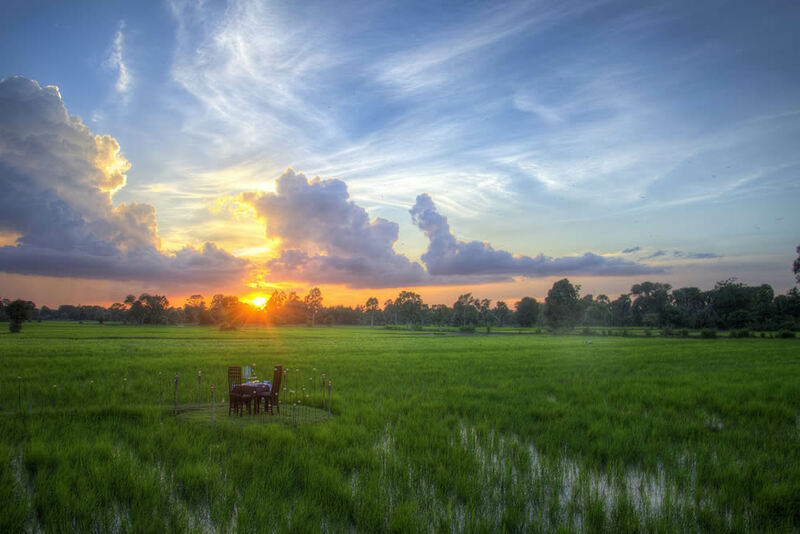 Cambodia is tropical year-round destination but there are two distinctive seasons. November-April for dry and sunny weather. May-October are wetter but quieter months. Blue skies and sunshine with little chance of rain and high water levels on Tonle Sap mean boat trips are still possible to visit the fishing communities. This is one of the best times to visit Cambodia with wonderful sunrises and sunsets over the paddy fields, temples and water bodies. With a reduced chance of rain and plenty of sunshine, March is a spectacular time to visit Cambodia. 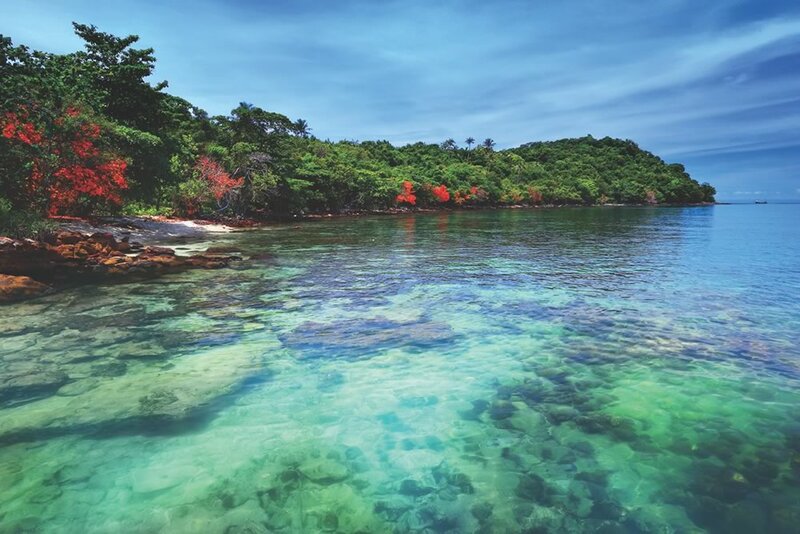 Escape the heat with a dip in the Koh Rong Archipelago at the end of your holiday. With increased humidity, the second half of the month sees the arrival of the monsoon, when temperatures drop a little and the country experiences short downpours. Slashing and burning of crops in the countryside pollutes the air sometimes creating a haze. During the monsoon, it is best to avoid the coastline but enjoy the main attractions inland with few other tourists in sight. There are some great deals to be had at the hotels and the high humidity is broken by the short heavy rain storms. High humidity with continued rains and some dry days. The thunderstorms offer wonderful photography opportunities over the lush emerald paddy fields and dramatic temples. August is the peak monsoon month, but the rain remains intermittent and is heaviest in the south. 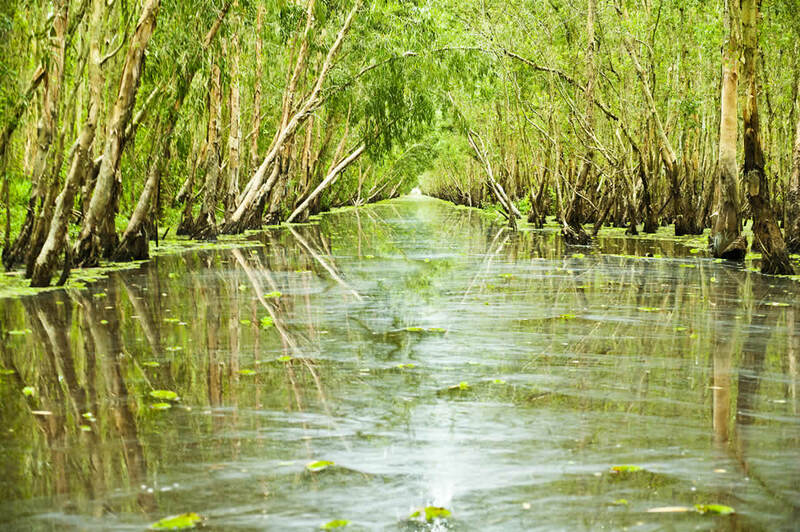 This is a great time to explore Tonle Sap’s stilted and floating villages by boat or kayak and swim under the 20m waterfalls in the Kulen Mountains. The continued sporadic warm rain ensures the countryside is at its most beautiful giving way to wonderful photographic opportunities with more cloud cover and temple reflections in the water pools that form around the Angkor complex. 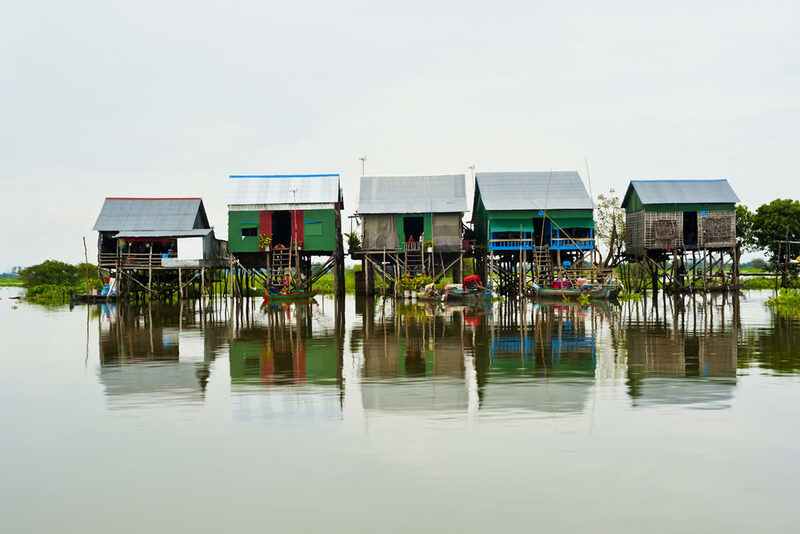 The rains lessen and Tonle Sap will have grown by over 5 times its size by the end of the rainy season, so take the opportunity to visit the stilted and floating villages by boat or by kayak. Pleasant dry and cool days, perfect for sightseeing, exploring the countryside and coastline, particularly in the mornings and late afternoons. Visit the boat races in Phnom Penh during the water festival. This is one of the peak months to visit Cambodia, particularly over the festive period, so don’t leave it too late to book so we can guarantee you the best guides and rooms.